This is the last article about KVM virtualization on Ubuntu (I, II, III). In the first post, I choose as hypervisor localhost (QEMU). 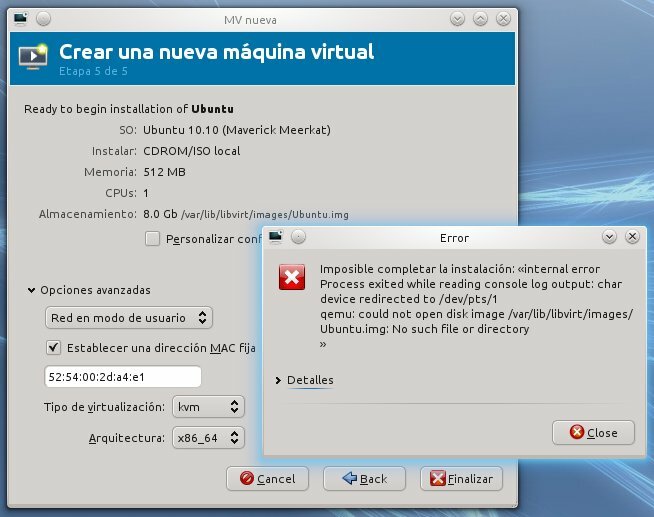 If you pick out the other hypervisor available (localhost (QEMU Usermode)) and try to set up a virtual machine, in the last step you will get an error with the following text: "Imposible completar la instalación: «internal error Process exited while reading console log output: char device redirected to /dev/pts/1 qemu: could not open disk image /var/lib/libvirt/images/Ubuntu.img: No such file or directory". The problem is when you select this hypervisor, the virtual machine is created with your user account, and if you take a look at the permissions on the /var/lib/lubvirt/images directory, you will see that only the root user can write in it. The solution consists in changing the directory from root to libvirtd group and adding write permissions. Remember that with this sort of connection (localhost (QEMU Usermode)), the storage will be into the /var/lib/libvirt/images directory, but the configuration and log files will reside in the user home. During four articles, we have learnt how to make virtual machines with KVM, libvirt and Virtual Machine Manager. I still have to present several articles related to snapshots, access to hypervisors running on remote machines, types of virtual networks, etc. KVM is a great option to handle virtual machines. It would be a good idea to carry out some tests in order to meter the performance of different types of hypervisors, such as Xen or VMware.